Butterflies and caterpillars are some of our favorite Spring themes for our Virtual Book Club for Kids! This week we are reading Eric Carle's The Very Hungry Caterpillar and making sparkly spin art butterflies! 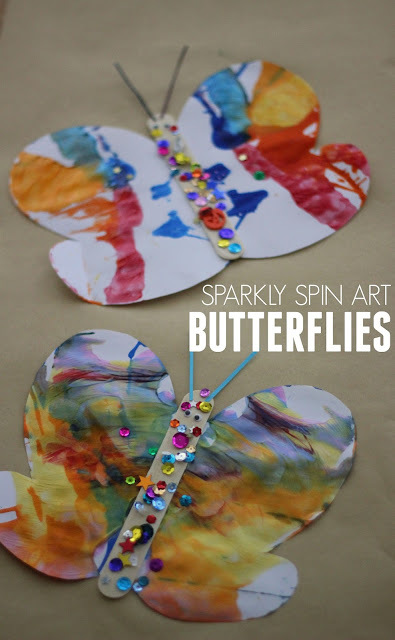 These sparkly butterflies offer a simple symmetry lesson AND give kids the opportunity to develop some simple fine motor skills too. Have you ever tried salad spinner art? It is one of our all time favorites! 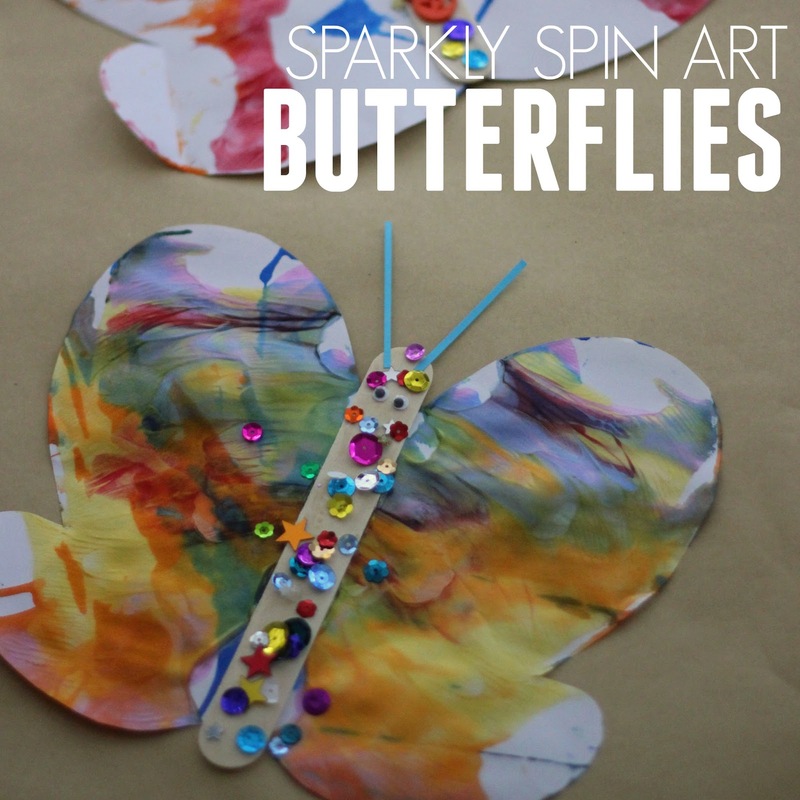 To get started with spin art butterflies, first fold a piece of paper in half and cut out a butterfly (see below). Next, keep the butterfly folded in half and place it in the salad spinner. 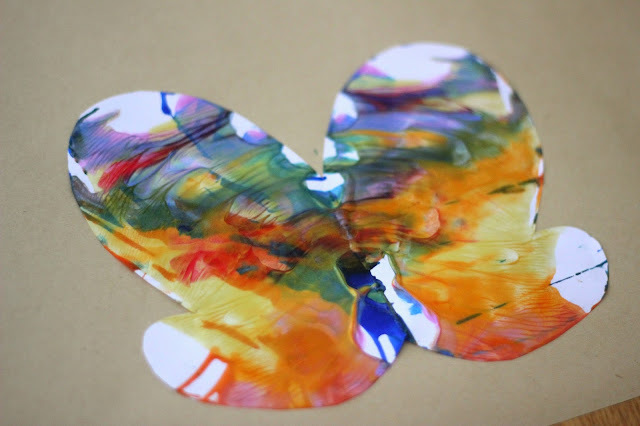 Add paint to the top of the butterfly, close the lid, and spin! Once you have tons of color on one half of your butterfly, open it up and fold it over and press the painted side onto the blank side. Open up the paper to reveal a gorgeous butterfly that has symmetrical colors!! To jazz these up a bit we added some popsicle stick bodies and sparkles. You can also just leave them blank and they will be beautiful that way too! Every time we opened up the butterflies the kids loved the surprise of seeing the bright colors on both sides of the wings! 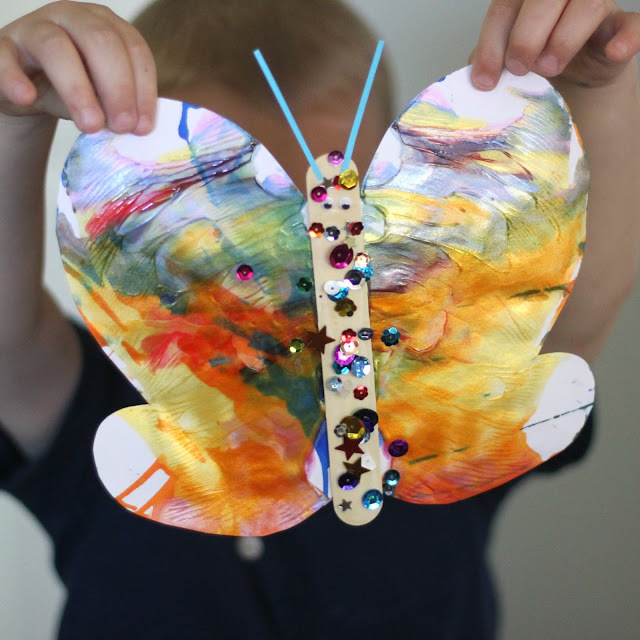 Have you done any butterfly activities with your kids before?